You'd think someone running one of the most sophisticated social media engagements in history would know better than to be super racist on Facebook. Or, you know, at all. We missed this last time we scanned Sacha Dratwa's Facebook profile—which he's left public through all the scrutiny. But now that Israel and Hamas finally have a cease fire in effect, we took another look. 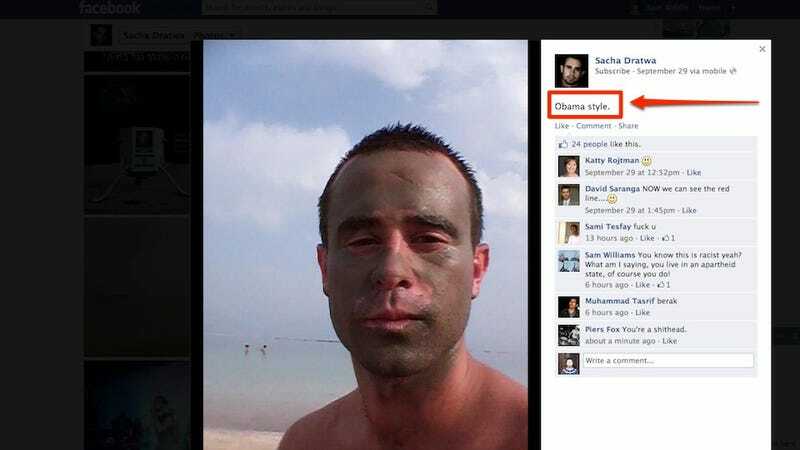 The above image of Dratwa's face smeared with what appears to be mud, uploaded by Dratwa himself, is captioned "Obama Style," a sentiment Obama probably wouldn't appreciate, particularly after funding the Iron Dome system that's helped the IDF protect innocent Israeli citizens. The photo was uploaded a month ago, and has been removed only within the last couple days.